Drawn to true stories of challenge and triumph, especially if they are set in a medical milieu? Care about improving the health care system? Love good writing that makes you stop and think about your own life? In this series, I'll share some of my favourite and most thought-provoking books on health, healing, and the system around it all.If you are lucky enough to have a local independent bookseller, please consider sourcing these books directly. The author describes his book as a survival kit, “put together out of my need to make sense of my own survival as I watch others trying to make sense of theirs.” He presents both a theory about the importance of telling stories as well as a number of medical narratives themselves. An in-depth exploration about writing as healing. Extensive references to the motivations and healing effects of the writings of many authors are provided as well. The book contains valuable advice and practical techniques to get started, to develop narratives, to connect events with emotions, to bring projects to conclusions, and to share with others. Excellent sources for further reading. These are stories from the point of view of family members who are providing caregiving for loved ones at home—one of the most difficult challenges anyone will ever face. In addition to case studies, the book includes information on where to get help and contributions from those involved in hospice care, as well as complementary and alternative medicine. Trained to zero in on a main symptom or chief complaint, doctors can miss important symptoms or facts which could steer them to a more accurate diagnosis. The authors, both doctors, offer patients and families a variety of tools to help them become active partners in their own care including “The 8 Pillars to Better Diagnosis”. Doctor-written essays bring together science and the soul, logic and feeling, and knowledge and wisdom. Dropping the masks necessary to communicate stability, these doctors have reveal the very human turmoil of their hearts and minds. This is a frank and moving film which reflects the views and feelings of patients and families who have experienced the impact of medical error. The perspectives of the patients and families offer insights that could improve the healthcare system and provider/patient communication. This book is a social awareness project, combining stories and photography designed to inspire young people under 30 who are diagnosed with cancer to know that they are not alone and that they can fight and win. The bookshelf is continually updating—click here to browse all recommended reads. Drawn to true stories of challenge and triumph, especially if they are set in a medical milieu? Care about improving the health care system? Love good writing that makes you stop and think about your own life? In this series, I'll share some of my favourite and most thought-provoking books on health, healing, and the system around it all. If you are lucky enough to have a local independent bookseller, please consider sourcing these books directly. Dr. Stein shares the personal narratives of sickness from his own patients. Through their points of view, we see that when people are diagnosed with a serious illness, they feel as though they are on a challenging and confusing journey, to someplace entirely new. They feel their bodies have betrayed them; are terrified by the unknown; and experience the loneliness of being kidnapped into the land of the ill.
Groopman takes us into the lives of those facing serious illness and what is learned when we can no longer take life for granted. This award-winning book captures the clash of two cultures, about a child diagnosed with epilepsy and a lack of understanding between staff at a small county hospital and a refugee family led to tragedy. This is about the need to honour cultural differences and bridge communication challenges. This short DVD documentary is about a physician and a patient who share an adverse medical event and struggle alone and then travel together on a journey of healing. Various patient and family stories can be found on the website—www.mitss.org. A former medical director shares stories, taken from actual case histories, to humanize some of the most challenging medical issues that face us in modern times. We travel from board rooms to emergency rooms and witness lives being saved and mistakes being made. The author knows of what he writes as he has also been a patient with throat cancer and has visited the shadowland between life and death. This short book is an impressionistic recounting of a young woman’s journey through a debilitating auto-immune illness and her uneven and complicated recovery. The writing is sparse, without embellishment or self-pity, and with unsentimental wit. As an English teacher, I loved leading students through the rules and nuances of grammar. I still love words and those times when a single word needs context to create meaning. Take the word “patient”. It could mean the noun “patient”, someone who is ill or injured and needs or is receiving medical care. Or it could mean the adjective “patient”, suggesting that someone is or needs to be prepared that something might take some time, even more time than one might want. Here’s my recent story of being a patient patient! Five weeks ago, on a Tuesday morning around 8 AM, my foot slipped while trying to get into a very high truck without helpful runner boards. The force and angle of the three foot drop was enough to seriously twist my ankle. I heard an internal ‘pop’ and felt intense pain. Given that I was away from home and had to fly about 6 hours the following day, I decided to head to Emergency to be checked out. I chose to become a patient. Early is always better than late. If you have to go to Emergency and you have any choice, going early on a weekday morning is better than waiting to go later in the day. There were four of us in the waiting room at 9 AM but by 10 AM, the waiting room was getting crowded. Everyone who shows up in an Emergency waiting room is worried. They're worried about the reason that made them come in the first place, about not knowing how long they will have to wait, about being fearful about potential outcomes. That morning, my waiting companions included a young father with an inconsolable crying toddler; a mother with her school-aged son, having been told by a walk-in clinic to go to Emergency right away without fully knowing why; a middle-aged woman who, post back surgery, was experiencing significant pain and didn’t know what else to do but come to Emergency because her doctor was away. They were all worried. Being a patient patient is difficult when it appears that no one is being called and no one is explaining why nothing is happening. There are usually valid reasons for delays. For example, as I was leaving the x-ray area, my porter came to an abrupt halt—before our eyes, we witnessed a “Code White”, a call for security back-up; a patient in a cubicle had started to attack the person looking after him. The response was impressive—quick and effective, resulting in a calmed patient. But people in the waiting room didn’t see the refocused energy and extra personnel required when that patient became violent. If only someone could touch base with people waiting to let them know what is going on behind the doors they can’t see through. I eventually learned that I had broken my ankle, fortunately not badly enough to need surgery. My leg and foot was placed in a walking-boot type of cast and sent on my way, back to the meeting I had been trying to get to at eight o’clock that morning in the first place. Now I am home being a patient patient as my ankle bone heals. It’s quite a change for me to not be able to drive, to not be able to go for long walks when the sun comes out, to not fill up the bird feeders myself, to not being able to just go to the grocery store when I think I need more grapefruits. Someone asked me what I thought the ‘message’ was for me in this…and I replied, “I’m more interested in thinking about the ‘opportunities’!” And there have been many. I’ve slowed down. I happily watch robins find worms on my lawn. I’ve learned to ask for help and have enjoyed the car rides and conversations with friends who have willingly ferried me from A to B and back again. I had time to think about what two poems I would take to my book club for a poetry night and was delighted to discover that the two I chose (Ulysses by Alfred Lord Tennyson and the lyrics to The Impossible Dream from the play The Man of La Mancha) were two of twenty poems I selected for a poetry project, done back in 1970, and kept these many years. I have also read more books than I’ve read in quite a while. One of them was a delightful and thoughtful memoir by Anne Berube titled Be. Feel. Think. Do. The author shares how she learned to prioritize being and feeling over thinking and doing in order to experience her life more richly, fully, and true to her deepest callings and dreams. She makes the point over and over again that we can choose our attitudes and can adjust our perspectives. No question about it—I am a lake. Yes I broke my ankle but I’ve been grateful for so much during this time of being a patient patient… grateful for friends; grateful for my attentive daughters and grandchildren; grateful for where I live; grateful for the signs of nature as spring unfolds; grateful for the care I received in that emergency department; grateful that my bone is healing; grateful for books; grateful for the opportunity to slow down and have time for reflection. Being a patient patient has its blessings! Beautifully written, this ‘biography’ of cancer covers 5000 years—from cancer’s first documented appearances to radical understandings of its essence. This book is a story of ingenuity and perseverance, but also of arrogance, paternalism, and misperceptions. You will want to embrace all those who have soldiered through draining regimens to survive and to increase the store of human knowledge. This series of biannual journals contain fiction, non-fiction, and poetry which reflect the human side of health and disease. Gawande, through shared personal experiences and the stories of others, examines how it is that we can do so much sophisticated and complex work in health care and yet still make serious mistakes. By looking at other industries, he discovers that simple checklists can improve care and reduce complications and deaths in our hospitals and clinics. This book shares the remarkable story of five ordinary people trapped in the complex world of serious illness: ALS (Lou Gehrig’s disease), non-Hodgkin’s lymphoma, Crohn’s disease, muscular dystrophy, and bipolar disorder. It includes poignant reflections about self-determination, courage in the face of adversity and public ignorance, and keeping hope alive. The author explores the components and manifestations of kindness and compassion and how important they both are for healing and good health. This academic book's message is that thousands of healthcare practitioners all over the world are overturning years of arrogance and ignorance to put their focus where it should have been in the first place: the patients. Two days after this remarkable book was published in France, its author died of heart failure. In December 1995, the 44-year-old former editor-in-chief of Elle magazine suffered a stroke that left his body paralyzed, a condition known as locked-in syndrome. His dictated account of his life is full of humour. This book of controlled clinical research studies how personal self-disclosure boosts both emotional health, physical health, and immune functions—and how inhibition has been linked to higher levels of anxiety, depression, insomnia, and a variety of health problems. In a way, we all know the story of Elizabeth Edward’s struggle with breast cancer and with her marriage. But we know less about the terrible effects on her of her teenage son’s death. This book takes us inside the private life and the extraordinary bravery of a woman who discovered how to live with grace. This book is a collection of Dr. Don Berwick’s speeches, including all those given from 2003-2012 given to the annual National Forum on Quality Improvement in Health Care. Each piece, full of stories and provocative questions and ideas, is augmented by a commentary offered by a variety of thought leaders in healthcare. This book is for anyone who likes to go behind the scenes and understand the dynamics of communication. The stories vary from ones of struggle to ones of collaboration and partnership. In the face of fear and isolation of both patients and physicians, Rita Charon—Professor of Clinical Medicine and director of Narrative Medicine at Columbia University—demonstrates how stories can open the door to better healing. Charon believes that illness and its care cannot be fully understood without taking into account patients’ stories. This is the story of a four-hospital system in Wisconsin which embraced “lean healthcare”, reducing errors, improving outcomes, raising morale, and saving $27 million without layoffs. These transformative practices “go to the gemba” (the bedside) with collaboration and respect. The author, a brain scientist, describes her experience of a massive stroke and recounts what she learned during her unusual and inspiring voyage of recovery. An Appendix titled “Forty Things I Needed the Most” is a compelling guide for everyone interested in patient and family-centered healthcare. Pearson shares her own experiences of the deaths of her father and sister, as well as perspectives from palliative care staff, scientists, and theologians. She encourages all of us who spend time with the dying—family members, friends, and healthcare staff—to be curious and quiet in their presence so that we can hear what is being shared. This anthology of 46 reflective essays and stories showcase a variety of experiences, such as the bravery of a young girl with AIDS; a blind woman trying to navigate her way to care; the dangers of talking in front of patients thinking they cannot hear; and the challenges of finding sensitive care for those with mental illness. For a week last November, Iowa City held me in its thrall. 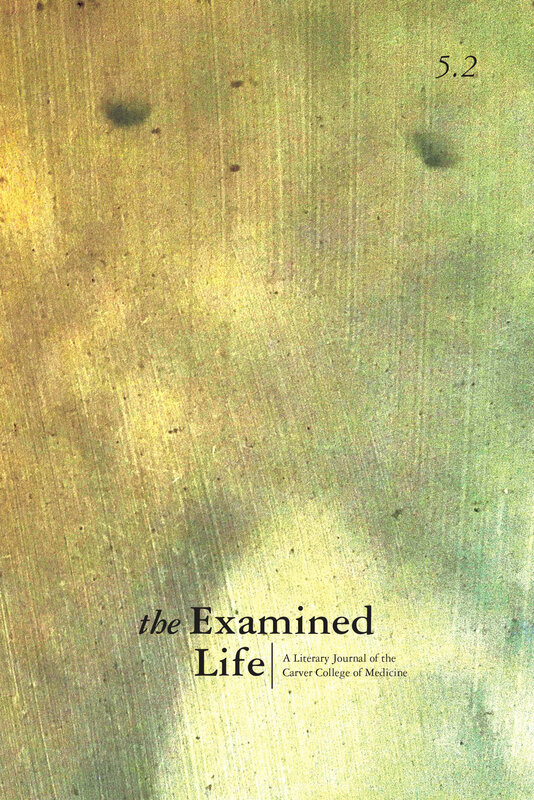 I was there for a conference at the University of Iowa titled “The Examined Life”. I had wanted to go to this conference for years; finally both the timing seemed right and the conference planners accepted my proposal for a workshop called “Healing Words: Writing Your Way to Compassion and Health”. The conference turned out to be everything I hoped for… a coming together of people engaged with in both writing and health care, many of whom wanted to be better communicators with their patients, to tell their own stories and to heal from the burdens they carried. In addition to the rich emotional and intellectual fuel of the conference, I also enjoyed several sessions which were part of the simultaneously scheduled Iowa City Book Festival. This annual festival is just one of the reasons Iowa City was named the third UNESCO City of Literature in November, 2008, following on the heels of Edinburgh, Scotland and Melbourne, Australia. Another reason for UNESCO’s choice was that, since 1936, Iowa City has been known as the home of the Iowa Writers’ Workshop which has produced many of America’s outstanding writers, including 17 winners of the Pulitzer Prize. I attended an author reading was given by Jon Kerstetter, whose book, Crossings: A Doctor-Soldier Story, had recently been published. 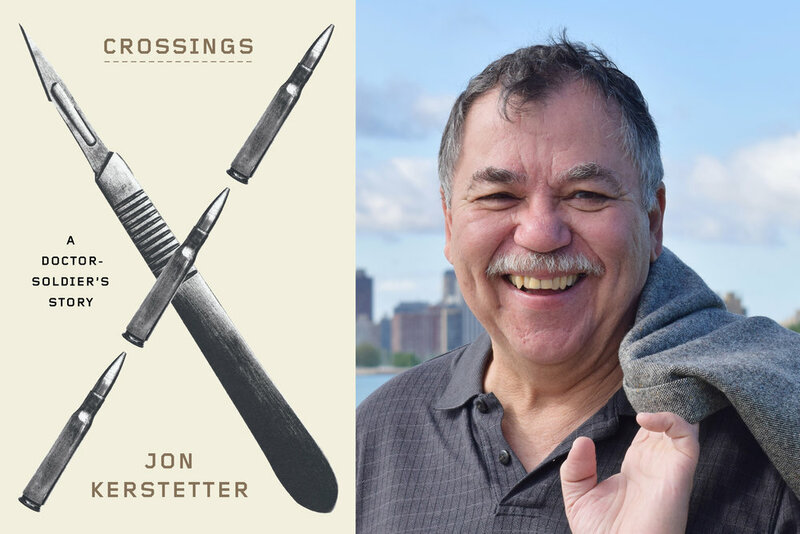 The book jacket says that Jon Kerstetter’s life “has been marked by a crossing from one world into another: from civilian to doctor to soldier; between healing and waging war; and between compassion and hatred of the enemy”. I had purchased the book earlier in the week thinking that this man’s story sounded incredible and I wanted to know more. Jon Kerstetter grew up in poverty on the Oneida Reservation in Wisconsin but his curiosity and determination led him to become an emergency physician and then a soldier, serving in Rwanda, Kosovo, Bosnia and Iraq. The first half of the book is full of descriptions of bravery and adventure and adrenalin and accomplishments. But then Jon’s life took a surprising turn and he faced a new ‘crossing’—from healer to one who needed to be healed, from one who helped ease other’s burdens to one whose own burden seemed impossible to carry. At the reading, I observed a tall man, standing, speaking clearly, engaging with his audience, recounting various chapters of his life… poverty to college education, First Nations reservation to army barracks, emergency rooms to helicopter evacuations. If you just walked into the room, knowing nothing of this man, you would never know that his just being able to stand there and speak belied the greatest challenge of his life. When Jon returned from Iraq, he had a debilitating stroke. Everything changed—Jon went from a decorated doctor-soldier to having to learn how to do everything from scratch. The stroke left him with profound cognitive and physical disabilities, excruciating pain, all complicated by PTSD. Jon finally had to admit that he could never be a doctor or a soldier again; he knew he had to make another “crossing”. One of his doctors helped Jon realize that his love of books was grounded in a thirst for knowledge. Building on this, the doctor suggested that Jon enroll in a writing MFA program. Jon had already experienced some ‘writing as therapy’ having done some therapeutic journaling and had felt its benefits. “Healing” has been a years-long process for Jon and is still ongoing. He says he still stumbles and forgets words. All the more amazing, then, that he chose to write this incredible book and could stand and tell us about it! And so I end where I began—I attended a conference on “The Examined Life” in Iowa City and gave a workshop about “Healing Words” to health care providers who wanted to explore the potential of writing to tell their stories and to lighten their burdens. And then I witnessed a powerful example of what I had been teaching… Jon Kerstetter is lightening his burdens and healing himself through words. It was a remarkable privilege to hear him speak and then savour his writing. The Mayo Clinic is known the world over as a mecca for medical excellence and great ‘customer service’. This book is based on personal interviews with Mayo Clinic’s leaders, clinicians, staff and patients as well as observing hundreds of clinical-patient interactions. In this book, you get the history, the business lessons, the philosophy and practice of “patients first”, and inspiring stories from staff and patients. As in Kitchen Table Wisdom, Dr. Remen uses wonderful stories to remind us of the power of our kindness and the joy of being alive. It was her grandfather who taught her that blessing one another is what fills our emptiness, heals our loneliness, and connects us more deeply to life. This is a mother’s story about her daughter’s medical journey who was diagnosed with a rare bone cancer when she was eight. The story recounts the array of medical treatments with the attending emotional and physical ups and downs, not to mention the mother’s exhaustion stemming from worry and lack of sleep. Dennis McCullough, a family doctor and geriatrician, presents slow medicine, an approach shaped by common sense and kindness which calls for anticipatory attending to an elder’s changing needs rather than waiting for crises that force acute medical interventions. He clarifies that this is a plan for understanding, for caring, and for helping people live well during their final years. This book inspires you to believe in happy endings and “the power of one” as it chronicles the life and work of Dr. Paul Farmer whose life’s calling is to cure infectious diseases and to bring the lifesaving tools of modern medicine to those who need them most. The story takes you from Harvard to Haiti, Peru, Cuba and Russia showing Farmer’s belief that the only real nation is humanity. Dr. Verghese documents the early years of the AIDS epidemic in Tennessee, besieged by young people dealing with what was deemed a plague. He writes with compassion about the conservative community as it confronted both the medical emergency and its deepest prejudices and fears. A tender narrative of the author’s parents’ deaths. This memoir examines the complicated world of procedure and technology-driven healthcare. The author raises profound ethical and personal issues we encounter as we care for those facing death & dying. This book captures the blogs and postings of Dave deBronkart as he journeys through his experiences with cancer and his unanticipated recovery. One of his most profound discoveries is about the importance of engaged patients and things one can do to be fully informed and to advocate for oneself. This book tells the story of Josie, an 18-month old who died as a result of a medical error in a teaching hospital. Sorrel King believes her intuition, had it been listened-to, might have intervened to save Josie, and she writes about the positive change that might make medical care safer for both patients and providers. Pulitzer Prize winner Gail Caldwell crafts a story of two friends who shared everything—until one of them was diagnosed with terminal lung cancer. This is a beautiful book about coming of age in the middle of life. This book chronicles what happens to a dedicated, conscientious, and caring family physician who has a brain stem stroke and fights to regain a life for himself. He reflects on both his experiences as a patient, in acute care and in rehabilitation, and his practices as a physician. This book documents Julie Salamon’s unprecedented year-long access to the inner workings of a contemporary hospital—Maimonides Medical Center in Brooklyn, NY. Stories of patients and staff are captured alongside the financial realities of operating a huge, overburdened private institution. The Annotated Book List at the back of the book, with a synopsis and the first sentence for each, is a fantastic list for anyone who likes to read medical literature. In analyzing how doctors think and how they diagnose patients, Groopman discovers that doctors sometimes make snap decisions that are usually correct but sometimes can be catastrophically wrong. Through his own personal experiences and other case studies, Groopman offers importance advice for patients and families…to ask clear, direct, and intelligent questions and to persevere in telling their stories so that, together, they can make better decisions. For years, as a pioneering pediatric neurosurgeon, Dr. Epstein's young patients taught him about the importance of seizing the moment and loving without boundaries. Their insights and wisdom further helped him when, after a bicycle accident, he suffered a traumatic brain injury and began the same journey. The author says this book “describes the reality of patient care—both the good and not so good—through stories.” The stories make us ponder how we can do better. This is the kind of book you can open anywhere and immediately enter experiences that will speak to you. A baby is born with a heart defect which requires surgery at birth. The boy lives his life with spirit, but upon adolescence, he is threatened by a mysterious illness. His father, racing against time, is challenged by what he perceives as flaws in the healthcare system.